"Keyboard for piano and guitar" on folded leaf tipped in; includes guitar chord diagrams. Includes indexes. Schirmer, 2009-03-03. 10. Paperback. Used:Good. 2012-04-08. New. Ships with Tracking Number! INTERNATIONAL WORLDWIDE Shipping available. Buy with confidence, excellent customer service! 2009-03-05. New. Ships with Tracking Number! INTERNATIONAL WORLDWIDE Shipping available. Buy with confidence, excellent customer service! Cengage Learning. PAPERBACK. 0840029985 New Textbook, Ships with Emailed Tracking from USA . New. 2003-02-02. New. Ships with Tracking Number! INTERNATIONAL WORLDWIDE Shipping available. Buy with confidence, excellent customer service! Schirmer. PAPERBACK. 0495572209 NEW TEXTBOOK, SHIPS WITH EMAILED TRACKING FROM USA . New. Cengage Learning. PAPERBACK. 0840029993 New Textbook, Ships with Emailed Tracking from USA . New. Cengage Learning. PAPERBACK. 0840029993 BRAND NEW W/FAST SHIPPING! This item is: A Creative Approach to Music Fundamentals (with CourseMate, 1 term (6 months) Printed Access Card), 11th Ed., by William Duckworth; FORMAT: Book With Online Product; ISBN: 9780840029997. Choose Expedited for fastest shipping! Our 98%+ rating proves our commitment! We cannot ship to PO Boxes/APO Addresses or outside the continental U.S. To avoid ordering the wrong item, please check your item's ISBN number! . New. Cengage Learning. PAPERBACK. 049509093X New US Edition Textbook, Ships with Emailed Tracking from USA . New. Wadsworth Publishing Co Inc, 1988-08-27. 3rd. Paperback. Used:Good. Schirmer, 2012-01-10. 11. Paperback. Used:Good. 1997-12-31. New. Ships with Tracking Number! INTERNATIONAL WORLDWIDE Shipping available. Buy with confidence, excellent customer service! Schirmer, 2012-01-25. 11. Paperback. Used:Good. Cengage Learning. PAPERBACK. 0840029985 BRAND NEW W/FAST SHIPPING! 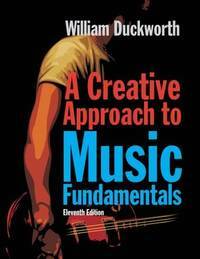 This item is: A Creative Approach to Music Fundamentals (Book Only), 11th Ed., by William Duckworth; FORMAT: Bound Book; ISBN: 9780840029980. Choose Expedited for fastest shipping! Our 98%+ rating proves our commitment! We cannot ship to PO Boxes/APO Addresses or outside the continental U.S. To avoid ordering the wrong item, please check your item's ISBN number! . New. Schirmer, 2006-01-10. 9. Paperback. Used:Good. Wadsworth Pub. Co, 1981-01-01. Hardcover. Used:Good. Wadsworth Pub Co, 1994-08-01. 5th. Paperback. Used:Good. Cengage Learning. PAPERBACK. 0840029993 Brand New ,Original Book , Direct from Publisher , Express 5-8 business days , worldwide delivery. . New. Cengage Learning. PAPERBACK. 0840029985 Expedited shipping NOT available. Brand New. Exceptional customer service. Standard shipping is ground. All deliveries in 4-14 business days. . New. Cengage Learning. PAPERBACK. 0840029985 With keyboard; Teacher's Edition (same contents as the student edition plus extra material). Marked Not for Resale with disclaimer. New and in great condition with no missing or damaged pages. Need it urgently? Upgrade to Expedited. In stock and we ship daily on weekdays & Saturdays. No Access Code. . New. 2000-02-03. New. Ships with Tracking Number! INTERNATIONAL WORLDWIDE Shipping available. Buy with confidence, excellent customer service! Schirmer. PAPERBACK. 0495572209 Item in very good condition! Textbooks may not include supplemental items i.e. CDs, access codes etc... . Very Good. Wadsworth Pub. Co. Used - Good. Good condition. Binder Ready! Stamped on inside. Wadsworth Publishing Co Inc, 1988-08-27. 3rd. Paperback. New. There is very little shelf wear. The spine remains free of creasing. The pages of this book are clean and unmarked. FAST SHIPPING & FREE TRACKING! Cengage Learning. PAPERBACK. 0840029985 US Edition Textbook, May Have Highlights, Notes and/or Underlining, BOOK ONLY-NO ACCESS CODE, NO CD, Ships with Emailed Tracking from USA . Good. Schirmer, 2009-01-13. 10. Paperback. Used:Good. Cengage Learning. PAPERBACK. 0840029993 US Edition Textbook, May Have Highlights, Notes and/or Underlining, BOOK ONLY-NO ACCESS CODE, NO CD, Ships with Emailed Tracking from USA . Good. Schirmer, 2003-07-24. 8. Paperback. Used:Good. 1984-11-08. Good. Ships with Tracking Number! INTERNATIONAL WORLDWIDE Shipping available. May not contain Access Codes or Supplements. May be ex-library. Shipping & Handling by region. Buy with confidence, excellent customer service! 1988-08-27. Good. Ships with Tracking Number! INTERNATIONAL WORLDWIDE Shipping available. May not contain Access Codes or Supplements. May be ex-library. Shipping & Handling by region. Buy with confidence, excellent customer service! Schirmer Books, 2000-07-28. 7th. Paperback. Used:Good. 1997-12-31. Good. Ships with Tracking Number! INTERNATIONAL WORLDWIDE Shipping available. May not contain Access Codes or Supplements. May be ex-library. Shipping & Handling by region. Buy with confidence, excellent customer service! 2012-04-08. Good. Ships with Tracking Number! INTERNATIONAL WORLDWIDE Shipping available. May not contain Access Codes or Supplements. May be ex-library. Shipping & Handling by region. Buy with confidence, excellent customer service! 2009-03-05. Good. Ships with Tracking Number! INTERNATIONAL WORLDWIDE Shipping available. May not contain Access Codes or Supplements. May be ex-library. Shipping & Handling by region. Buy with confidence, excellent customer service! Wadsworth Publishing Co Inc, 1991-09-27. 4th. Paperback. Used:Good. Schirmer. PAPERBACK. 0534517684 New Condition. . New. Cengage Learning. PAPERBACK. 049509093X US Edition Textbook, May Have Highlights, Notes and/or Underlining, BOOK ONLY-NO ACCESS CODE, NO CD, Ships with Emailed Tracking from USA . Good. Wadsworth Pub Co, 1997-12-01. 6th. Paperback. Used:Good. 2000-02-03. Good. Ships with Tracking Number! INTERNATIONAL WORLDWIDE Shipping available. May not contain Access Codes or Supplements. May be ex-library. Shipping & Handling by region. Buy with confidence, excellent customer service!